On the Senate floor Monday, an exasperated Mitch McConnell sounded off on the "unsubstantiated smears" against Supreme Court nominee Brett Kavanaugh. In the past week, two women have come forward to accuse Kavanaugh of sexual assault. Ford is going to testify about her experience before the Senate Judiciary Committee. So far, she has had trouble recalling the alleged incident. The second accuser, Deborah Ramirez, says the nominee assaulted her at Yale, but both the New Yorker and the New York Times could not corroborate the story. McConnell said enough was enough. "Democrats have signaled for months they’d put on whatever performance the far-left special interests demanded and throw all the mud they could manufacture," he said. "Well, it’s not like they didn’t warn us. But even by the far left’s standards, this shameful smear campaign has hit a new low." CNN anchor Brooke Baldwin stopped McConnell right there during her broadcast. This is the same McConnell that wouldn’t hold a vote on Merrick Garland? Baldwin asked. "That’s pretty rich." 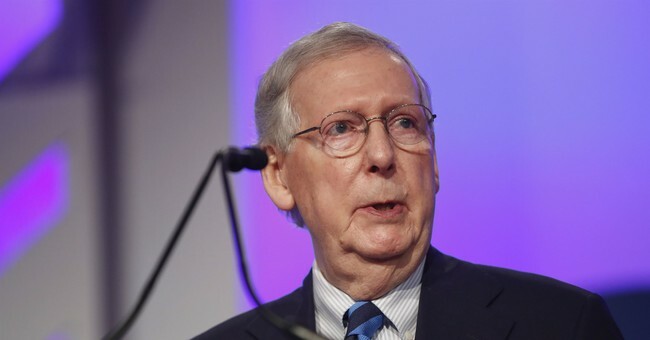 When President Obama nominated Merrick Garland to replace the late Justice Antonin Scalia, McConnell stood his ground and did not hold a Senate vote. Her guest Gloria Borger agreed that it was "rich" considering he's now sounding off on Democratic obstruction. She added that it's also "rich" that McConnell was quoting the New York Times to prove his point. "When do Republicans quote the New York Times," she mocked. Still, McConnell made a pledge. "Before the week is out, both Judge Kavanaugh and Dr. Ford will testify under oath before the Judiciary Committee," he said. Kavanaugh has strongly rejected both allegations. In a letter to Judiciary Committee Chairman Chuck Grassley, he indicated he has no plans to withdraw his nomination. He'll be defending his honor tonight during an interview with Fox News's Martha MacCallum.